I’ve long been a fan of selling on our pre-loved clothes. Decluttering is so therapeutic – I love having our biannual wardrobe shake up. Sorting different orange sacks with bits to go to charity which have had their day and bits to sell on takes me to my happy place. Plus, clearing space means I can then go shopping for new things! Facebook marketplace was really great for a couple of years but there is just SO MUCH stuff now on our local marketplace that I’m finding nothing sells. Or people want to bargain you down for EVERYTHING! So I’ve recently gone back to eBay – I’ve listed a couple of too small winter coats to see how I get on as it’s been a while since I used eBay. Here’s how I found it…. 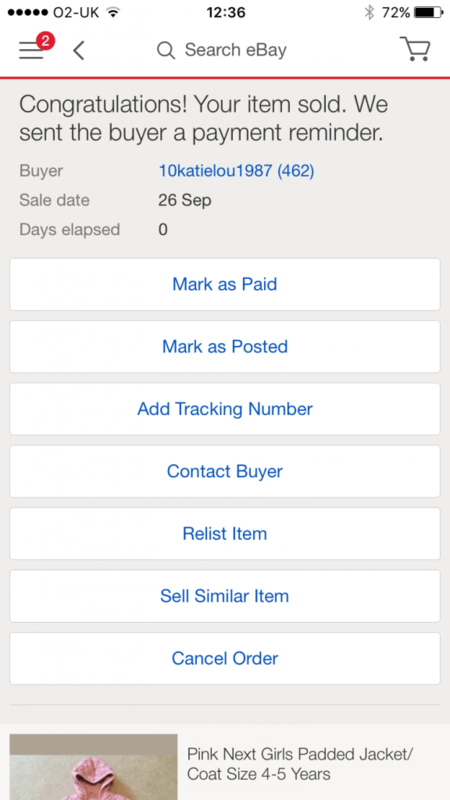 You can sell via the eBay app (on iTunes store or Google Play) or via the desktop/ mobile site so eBay is as easy as Facebook from a user perspective. I used the app and find it really easy and quick to use. There is step by step guidance on listing an item on eBay – you are guided through adding photos, adding descriptions, sizes, brands, collection/postage details and turnaround time. How many times have you seen a Facebook advert where someone has to ask the size of the clothing as the seller hasn’t put it in the description! Obviously the more information you provide to a potential buyer, the more helpful it is for them to decide if they want to bid. Once you have put all the information in, the listing is live immediately on eBay – no waiting for admin approval. You get access to 18 million buyers in the UK with eBay, whereas Facebook selling groups tend to be more local. As long as you are happy to take a trip to the post office, your market is so much bigger with eBay so the item in theory has more likelihood of selling. Even if you don’t want to post any items, you can use eBay and select collection only. You get a fair price for the item. Many times I’ve seen an item for sale on Facebook with 20+ comments asking to be next in line – this was probably priced too low in the first place. If this same item had been on eBay, the final price would have been increased by the competing buyers. You do pay a fee to sell on eBay, but its relatively small and for me, outweighed by the advantages. For more information, see here and there’s a fee calculator here. If you need any tips on how to get the most out of eBay selling, have a look at the simple selling guide for some great tips. One of my items has sold so I am off to the post office this morning! What are you waiting for? 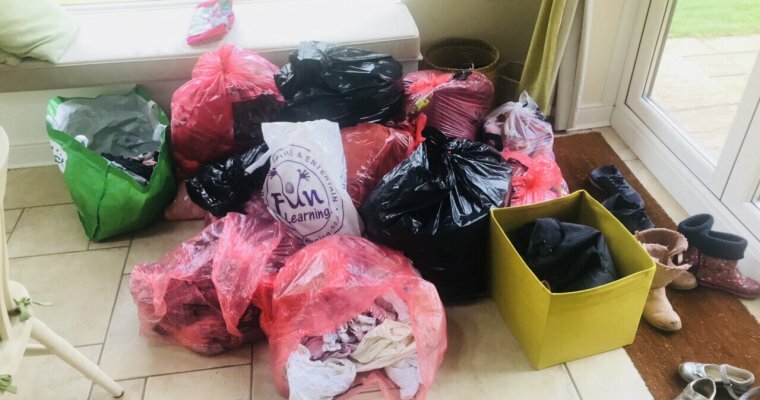 Have a good clear out – you’ll feel better for it! I am a member of the Mumsnet Bloggers Panel, a group of parent bloggers who have volunteered to review products, services, events and brands for Mumsnet. I have received a voucher as a token of thanks for this post however, I have editorial control and retain full editorial integrity. I’m also taking part in the Money Making Madness Linky hosted by Charlotte Burns from Lotty Earns, Emma Bradley from Mum’s Savvy Savings, Emma Drew from EmmaDrew.Info and Lynn from Mrs Mummy Penny. I prefer eBay – your potential marketplace is huge! Although you do have to pay fees obviously, you also get some protection as a seller and as a buyer. Facebook is good for larger items like furniture though.